"Our team cares about what you’re going through. Even if hope is hard to see, it is there, and we want to help you find it. We’ve helped thousands of individuals with an eating disorder successfully travel the road to resilience. You are not alone. " An eating disorder can consume your thoughts, diminish your self-confidence, and ultimately damage your health. 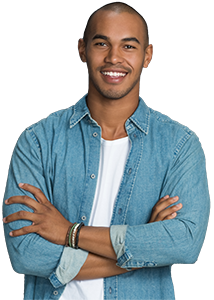 Rogers Behavioral Health provides highly specialized eating disorder treatment, with programs for men, women, children and teens. We’ve helped thousands of individuals – both male and female. We’re here to help you. Call 800-767-4411 or request a free screening. Answer the questions completely and honestly. Your responses should reflect the way you feel now, not the way you wish to feel. Remember, it is never too late to seek help. The quiz below can help you decide if you behave in a way that demonstrates a tendency towards an eating disorder. While helpful, it is not intended to diagnose any particular eating disorder. 1. Been preoccupied with your weight and/or the shape of your body? 2. Avoided eating certain foods due to fearing that something bad could happen to you? 3. Felt out of control over the amount of food you ate one or more times in a week? 4. Worried frequently about the nutritional content of different foods? 5. Felt intensely disgusted or anxious when looking at your body or seeing it in a mirror? 6. Frequently avoided eating because of disliking the taste, smell, or texture of foods? 7. Felt guilty or upset after eating an unusually large amount of food one or more times a week? 8. Intentionally made yourself vomit or exercise excessively to prevent gaining weight? 9. Been consistently anxious when eating food or drinking liquids? 10. Felt a need to check the appearance of your body often throughout the day? Thank you for taking this important step. Your responses indicate that you are experiencing ONE OR MORE symptoms of an eating disorder. While the results of this quiz cannot verify a diagnosis, you can request a free screening or call 800-767-4411 to learn more. Your responses indicate that you DO NOT have symptoms of an eating disorder. If you are still concerned, you can request a free screening or call 800-767-4411 to learn more.